Last week, we completed an exciting service-learning project with statistics students at Columbia Basin College. 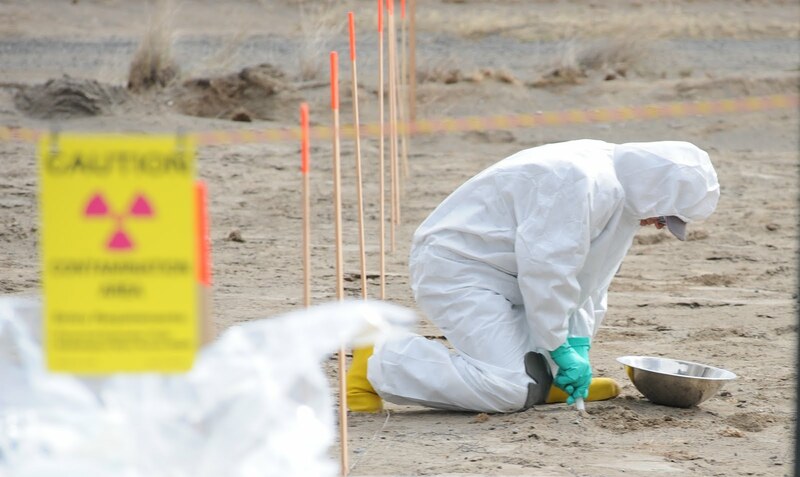 They helped Ecology’s Nuclear Waste Program do statistical analysis on soil contamination data from Hanford’s 200 Area. Our goal was to see if new multi-increment soil sampling produces similar results to the current discrete sampling methods used statewide: systematic and judgmental. This was a big step forward in a process that began three years ago. In 2008, with the U.S. Department of Energy, our program initiated an effort to test multi-increment sampling, a process adopted by state agencies in Alaska and Hawaii. This proposed change to Washington state soil sampling standards would save time and money and potentially improve soil sample quality. With systematic and multi-increment sampling, a contaminated site is divided into a grid composed of 30-50 units, and a sample is collected from each. Each systematic sample is then analyzed separately, which is costly due to the high number of samples and the time it takes to process that volume of data. Judgmental sample locations are chosen using radiochemical detection equipment and professional judgment, and are also processed individually. But multi-increment samples are combined into one composite sample and analyzed. With this method, a larger soil sample can be extracted for analysis at a lower cost than it would take to cover the site with discrete samples. The proof is in the dirtBut do the three methods produce similar results? Volunteer CBC classroom aide, tutor, and statistician-in-training, Kelly Rogers, compared the contaminant levels detected with all three sampling methods. The results below are from her full report. Out of 44 comparisons of mean contaminant levels, results showed a high correlation between the multi-increment samples and the large number of systematic samples taken. The judgmental samples either overestimated or underestimated the average contamination level, depending on the contaminant. Nitrate contamination is a good example of judgmental sampling underestimating average contamination levels. When field workers first sampled this dried waste discharge pond, they assumed most of the chemical contamination would be near the radiological contamination, which held true for heavy metals. But nitrates appear to have moved down through the soil, separating from the other major concentrations of contaminants. Few differences were found between systematic and multi-increment samples, which supports changing state soil sampling standards. Judgmental sampling leaves the possibility of not taking enough samples and taking them in the wrong places. Now what?We consider this dried pond sample site homogenous because the contamination was fairly evenly spread throughout. Our next step will be to repeat the process, taking samples from a heterogeneous site with many “hot spots,” or areas of concentrated contamination next to areas with little to no contamination. Washington suspended most rule-making processes last year due to budget cuts. This pushed back the Model Toxics Control Act (MTCA) revision until 2012. MTCA is a state law guiding the cleanup of environmental contamination. This delay actually gives us a chance to further study multi-increment soil sampling, get others in the agency on board, and possibly revise the state standards in MTCA.